Yes, not long before the wedding, Laura had come down with mononucleosis and I had cut into my finger with a very sharp knife while cutting bread requiring a trip to the emergency room to get stitches. Two days before we got married, instead of moving furniture, I was getting stitches out of my finger. It wasn’t the kind of week we had planned. But it was the happiest, most amazing occasion I could have ever imagined. As I wrote last month, I am richly blessed indeed. 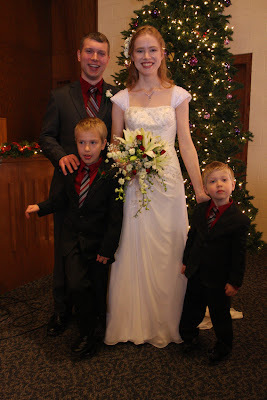 Our wedding was three days after Christmas. The church was still decorated for Christmas, with the tree in on corner, glittering stars suspended in mid-air on cables from the walls, wreaths and candles in the windows, and it was a joy-filled day. Before the ceremony, we took pictures — the only part of the day Jacob and Oliver weren’t thrilled with. Nevertheless, we got some fun ones. Laura and I seem to know quite a few pastors between us – and not just because Laura is a pastor. My brother officiated with the wedding vows, his wife with scripture and a prayer of blessing, and the church’s pastor gave the message. Laura and I wrote in our wedding program, “Music has long been a thread running through both our lives. We have enjoyed singing together, playing piano and pennywhistle duets, attending concerts, and even exploring old hymnals. Music is also one of the best ways to have a conversation – even a conversation with God.” We wrote a page in the program about each of the hymns that were a part of the wedding, and why we picked them. The combined church choirs of my home church and Laura’s church sang John Rutter’s beautiful arrangement of For the Beauty of the Earth (click here to listen to a different choir). Hearing “For the beauty of each hour”, “For the joy of human love”, and “Lord of all, to thee we raise this our joyful hymn of praise” was perfect for the day. It was with such great happiness that we walked out of the sanctuary, a married couple, to the sound of the congregation singing Joy to the World! Jacob and Oliver were so very excited on our wedding day. They happily explored the church while waiting for things to happen. 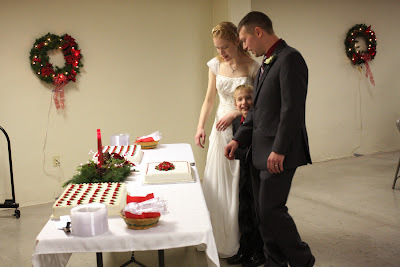 We had them help us light our unity candle, and they were pleased with that. Jacob loved his suit, which made him look just like me. And they were, of course, delighted with the cake and in the middle of it all. For our honeymoon, we managed to get two weeks of vacation, and spent about half of it at home. We had looked at various options for retreats in the country, but eventually concluded that our house is a retreat in the country, so might as well enjoy it at home. We also went to the Palo Duro Canyon area near Amarillo in the Texas panhandle, staying in a small B&B in Canyon, TX. Palo Duro is the second-largest canyon in North America, and quite colorful year-round. What a beautiful place to go for our honeymoon! By the time we got there, Laura was getting past mono, and we went for hikes in the canyon on two different days — hiking a total of 10 miles, including a hike up the side of the canyon. After we got back home, on the last weekday of our honeymoon, we went back to the Flint Hills of Kansas, to some of the same places we had spent our third date. We climbed the windy staircase at the Chase County Courthouse, the oldest courthouse still in use in Kansas. And peered out its famous oval window. We found the last remnant of the old ghost town of Elk, ate at the same restaurant we had that day. It brought back wonderful memories, and it was a good day in itself. 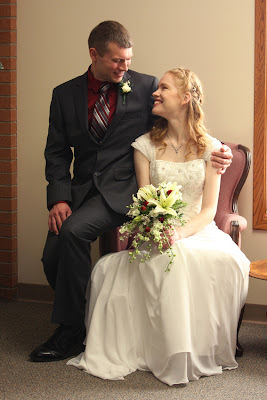 Because even though it was a gold, drizzly, overcast day in January, this time, we were married. And this year, Thanksgiving is all year. I’m pleased for you both. Here in England, there has always been the position of “vicar’s wife” – helping with church fetes, dutifully supporting your husband in his work – you see them in English detective stories … one of my favourite female clergy, and Susan’s former minister has a wonderful husband who answers to “Mr. Vicar” Does this now mean that you’re Mr. Pastor? \o/ Congratulation to both of you! The Lord bless you with all his love!